An OMRF scientist has received a $3.2 million federal grant to continue research into a rare immune disease called sarcoidosis. 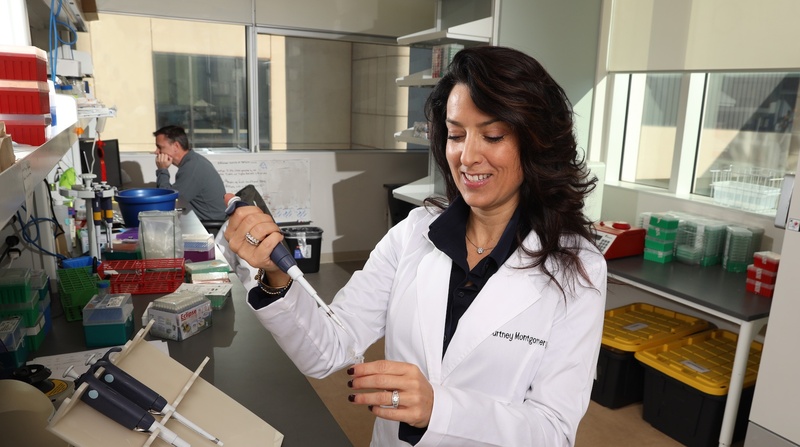 The 4-year grant from the National Heart, Lung and Blood Institute will help OMRF researcher Courtney Montgomery, Ph.D., and her team determine the roles of specific immune cells associated with the disease. Sarcoidosis is a poorly understood disease where cells in the immune system that cause inflammation overreact and cluster together to form tiny lumps called granulomas. These granulomas can form in the eyes, liver, skin and brain and most often are found in the lungs. If too many form in a single organ, they can cause the organ to malfunction or even fail. It can strike anyone, but sarcoidosis disproportionately affects African Americans: Disease incidence has been reported as high as 39 in 100,000 among African Americans, versus five in 100,000 for Caucasians. African Americans are also 10 times more likely to die from it than their European-American counterparts, and there is no cure. The disease led to the deaths of actor-comedian Bernie Mac and NFL Hall of Fame defensive lineman Reggie White. The grant will also help Montgomery recruit new patients and healthy volunteers to collect samples for OMRF’s Sarcoidosis Research Unit, which began in 2018 and is the only one of its kind in the state. Participants will be compensated $20 per visit for their time and effort. To participate in the study or for more information, please call the Sarcoidosis Research Unit at 405-271-2504 or toll-free at 800-605-7447 or email sru@omrf.org. The Foundation for Sarcoidosis Research, the nation’s leading nonprofit organization for sarcoidosis, has supported Montgomery’s research in the past and expressed enthusiasm for the new grant. “FSR is proud to continue supporting Dr. Montgomery and strong, novel research that leads to breakthroughs in the space as well as additional funding opportunities,” said FSR Executive Director Ginger Spitzer. The grant, R01 HL113326, was funded by the NHLBI, part of the National Institutes of Health.